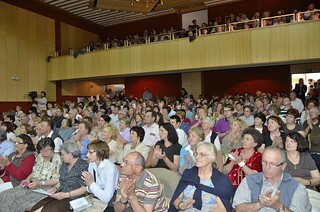 On Thursday, May 12th, Vassula Ryden and I departed from Athens for Ljubljana in Slovenia. Vassula recalled her last visit to Slovenia which was about 13 years ago and she seemed happy that she would be there again. We had a pleasant trip as it is only a two hour flight from Greece to Slovenia. When we arrived we were warmly welcomed by Fr. Marijan Šef, DJ (a Jesuit priest, medical doctor and retired professor of the theologian faculty of Ljubljana) and True Life in God dedicated readers. When they saw Vassula they stared singing “Doxa, Doxa” and they offered her and me two beautiful wooden crosses that were nicely decorated with flowers. While Vassula was greeting the people who came to welcome her, the previous prime minister of Slovenia, , and current Member of the European Parliament of the New Slovenian Party, Mr. Alojz Peterle, happened to arrive there at the same time from Brussels. . When he was exiting the airport, he noticed Fr. Marijan Šef and Vassula being surrounded by so many people and he slowed down. Fr. Marijan Šef happened to know Mr. Alojz in person, and after a brief greeting he introduced Vassula to him. Mr. Alojz noticed the enthusiasm of the group and the joy they showed, wondering the reason. He looked at Vassula and exchanged a few words with her. Vassula had informed him briefly of her mission that the Lord had given her. His reaction showed that he was a man of faith and open to the gifts of the Holy Spirit. He pulled out his visit card and gave it to Vassula. 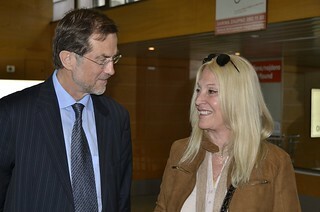 Vassula with Ex Prime Minister of Slovenia, Mr. Alojz Peterle and current Member of the European Parliament of the New Slovenian Party with Vassula at the airport. We have learned from God that the word “luck” does not exist in His dictionary; so we understood that this was a gesture of the Holy Spirit. Hardly out of the plane, not yet out of the terminal and there she was, testifying. This was the beginning of a very strenuous program. Really, God does not lose time or opportunities! Brigita, one of the TLIG organizers in Slovenia, “happened” to have with her the booklet of the Holy Odes and so she offered it to Mr. Alojz, at the same time writing in it contact details of where to find more information about the messages. Miha and Aneta, then drove us to Stična Abbey, which is considered to be the oldest monastery present in Slovenia, as it was first built in 1132 in the hillocks of Dolenjska. Its thick walls and its gothic style with its high arcades were most impressive. Its whole structure lifted one’s mind to imagine the contemplative saints roaming around in silence in its large corridors and pathways that led to their cells. Immediately upon our arrival we were warmly welcomed by Abbot Anton Nadrah, a tall, pale looking, soft spoken monk with a very gentle demeanor. . . One could tell from his reserved ways that he was a man of prayer and of silence, in other words, a contemplative monk. With few words, but with a smile, he escorted us to our rooms. Late in the evening, we all got together for our dinner. Eventually, Abbot Anton Nadrah and Fr. Branko Petaver, who is one of the Cistercian fathers of the monastery, also joined us. Vassula found herself testifying; it looked like she was urged by the Spirit to tell the Abbot, who knew a little about her, her story and of this mission that the Lord had given her. He was listening with interest, nodding now and then, while she was being interpreted. After breakfast the next day, May 13th, that is, Fatima’s Feast Day, , the organizers and the Abbot had arranged for a tour-guide to meet us and show us around the monastery, explaining to us its history while we were admiring the Romanesque-Gothic architecture of the building. Fr. Branko Petaver joined us and took us to the interior of the monastery where we saw some beautiful interior Baroque architectural decorations. He also showed us some artistic photos that he took of the monastery , as photography is his hobby. At this time, Fr. Branko also took the opportunity to have a brief discussion with Vassula about some matters related to her mission. At 11:00, we were led into the huge basilica of the monastery, which is dedicated to the Divine Mother. . In there, Vassula would be interviewed and filmed at 11:30 by a priest that Vassula had met many years ago: Professor Anton Štrukelj. Fr. Marjan Šef was also present and he too listened to the interview. Vassula was asked about various important topics regarding the basis of the message, as well as the clarification of certain TLIG related issues. They needed to be known and clarified since before our arrival, a priest had spread negative material to the Bishops about True Life in God. . The whole interview lasted for around 50 minutes. Professor Anton seemed very satisfied and glad to have had this opportunity to talk with Vassula so as to make known the truth and drown the falsehood about Vassula that had started to spread in small circles of the clergy. After the interview we had dinner with Professor Anton Štukelj and Fr. Marjan Šef ; later on, Abbot Nadrah joined us. Vassula, after being asked, had the opportunity to clarify with them answers to certain questions that were related to the old notification and the letter of Cardinal Levada. This information was much appreciated by the professors and clergy who were present. Here I would like to mention that prior to Vassula's visit to Slovenia, a priest who was for 25 years always against Vassula, tried with all his means to cancel her meeting in Maribor and upset the Bishops. He tried hard as well to stop the meeting that the organizers had arranged with the Archbishop of Maribor, by propagating slander and false accusations against Vassula. Praise the Lord, all these issues where handled by our Lord Himself keeping the doors open and everything that was scheduled by the organizers took place and with great success. After lunch, we thanked Abbot Anton Nadrah for his kind hospitality and we departed for Maribor (a 1h50min drive) where we had a scheduled meeting with the Archbishop of Maribor. We arrived in Maribor on time for our meeting, and at the Archdiocese we were welcomed by the retired Archbishop of Maribor, His Grace Dr. Franc Kramberger, (Ph.D) who knew Vassula from the past, and by the Ordinary Archbishop, His Grace Marjan Turnšek (Ph.D). They warmly welcomed Vassula and her companions. Vassula gave a short introduction on how her mission started and discussed with them about what our Lord says in the messages about Unity and His desire for all Christians to celebrate one date of Easter. Archbishop Turnšek said that the efforts of any person who endeavors towards this goal are appreciated. After our pleasant meeting with the Archbishops, we departed for the hotel. Our day ended with Holy Mass at a private Chapel that was at the house of Janez and Kristina Vozelj, where Fr. Lavrencij (a Franciscan priest) welcomed Vassula. As it was the Feast of our Lady of Fatima, after Holy Mass we had a litany and procession with candles in the garden, while carrying the statue of our Lady of Fatima. On Saturday, May 14th, Vassula had a full day. After breakfast at 10am, we rushed to a TV studio. 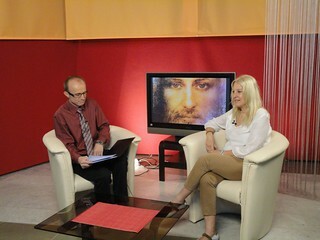 She had a scheduled interview for TV EXODUS, a spiritual channel. A young journalist who had met Vassula some years ago, Frenk Muzek, did the interview that lasted an hour. 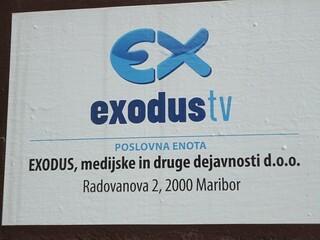 Immediately after, losing no time, we were invited to the home of Mr. Ivo Čerček, (he owns the building where TV EXODUS is hosted) and we met his family. Mr. Ivo Čerček had invited a journalist from the national TV in Slovenia, RTV SLOVENIA, Mrs. Janja Bukovec as well. This meeting was not a part of our program arrangement, however, people were so happy that Vassula was sent to them, that the word spread around the area like bush fire. Mrs. Jania interviewed Vassula in the beautiful garden of the house for about half an hour. After that, we went for a light lunch at the hotel and then hurried to the “(Bishop) Anton Martin Slomšek” Diocese Hall where Vassula would give her speech and address the people. Sadly, on our way to the Diocese Hall, the organizers informed us that all the posters that were posted to promote Vassula's meeting were taken down the night before by TLIG enemies who hoped and longed for the destruction of the meeting. The organizers were worried, and had no idea as to whether or not people would come to the meeting or how many would come. Again our Lord and our Lady of Fatima did not let us down. The diocese hall was filled up to the point where people had to stand at the sides of the aisles and at the entrance for lack of seats! At our arrival, some people touched to tears, recognized Vassula and came to greet her. 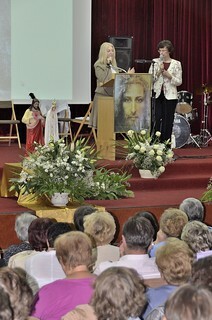 Vassula addressed the people, speaking to them about most of the subjects that the Lord and our Blessed Mother had given her. The people were touched right down to the heart while listening to her. Praised be the Lord and glory to Him, who with one hand puts aside our enemies and opens the way, calls the humble, the meek, and the poor in spirit to receive His Word. What a gift! Jesus had said once to Vassula: “Do not fear. I am known to have overthrown kings and kingdoms were they to become an obstacle on My Way.” Yes! If Jesus is with us, who can dare be against us? According to the organizers, many books (more than 200) were sold to the people as they were departing. When they will read, not only will they start living a true life in God, but they too will become witnesses and bring others to read the message of our Lord. It will react like a snowball and will crush any enemy and any sound that still might be lingering in the air. As much as our Lord’s enemies tried to stop this meeting, the Holy Spirit inspired people to overlook the negative sounds, and instead, came and listen to our Lord’s Hymn of Love. After Vassula's speech that was close to two hours, all the people who were present at the meeting, as well as Vassula and me, went to the Cathedral just across the street for Holy Mass which was celebrated by the General Vicar Janez Lesnik. We thanked God for the success of the meeting. Our day ended in this way, exhausted but happy. This somehow teaches us that we should trust the Lord, more and more, for everything is in His Hand. He is aware of all situations and in control of everything. We went for a pleasant dinner with only a few of the organizers, as Vassula was very tired and she needed some privacy and quiet to prepare herself for the next day’s drive from Maribor back to Ljubljana so as to depart for Athens. I pray that Vassula's visit to Slovenia and the seeds that were sown there will multiply and spread all over the country, and that the True life in God volunteers in Slovenia will be encouraged and multiply. 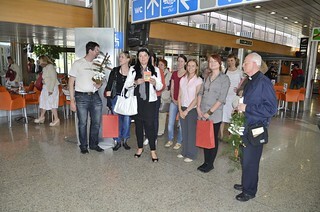 I was very happy to see that Vassula was warmly welcomed in Slovenia. I will end my report with a comment that Vassula did much for the Slovenians. She said that they are good hearted people, hospitable and with a nice sense of humor. 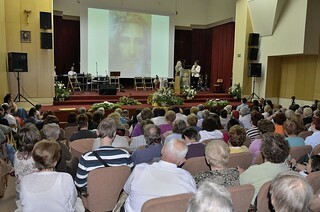 I pray that God will bless Slovenia and may she be an example to other European countries. All thanks and Glory be to God!